Today is my future sister-in-law's birthday and we celebrated last night at John's parents' house. We dined on steak and salmon, salads and sweet potatoes and finished the night with a tuxedo cake from Costco (delicious, I highly recommend it). We got her a gift certificate to a swanky restaurant in the area and to go with it I was going to make profiteroles but didn't have time. Instead, I turned to a recipe I saw in the LCBO Food & Drink magazine from last fall. Preheat the oven to 350 degrees. In a bowl cream 1/2 cup butter with 1 cup brown sugar. Beat in 1 egg and 2 tsp vanilla. Mix together in a nother bowl 1 1/2 cups flour, 2 tsp cinnamon, 1 tsp baking powder, 1/2 tsp baking soda, and 1/2 tsp salt. Add into the butter mix, alternating with 1 cup sour cream so that the flour is added in 3 batches and the sour cream is added in 2. Pour batter into a cake pan or other pan of your choosing. Bake for 45 minutes or until a tester inserted comes out clean. Meanwhile, in a pot over medium-high heat, combine 4 apples, peeled and diced, with 1/4 cup brown sugar, 1/4 tsp cinnamon, 1/2 tsp vanilla, and the juice of 1 lemon. Bring to a simmer, stirring occasionally, then reduce heat to medium-low and simmer for another 5 minutes or until apples are soft. In a bowl, whisk together 2 tbsp brown sugar, 2 tbsp water, and a pinch of cinnamon. Brush this glaze over the warm cakes then spoon the apple compote over each slice or mini-cake. Serve warm. 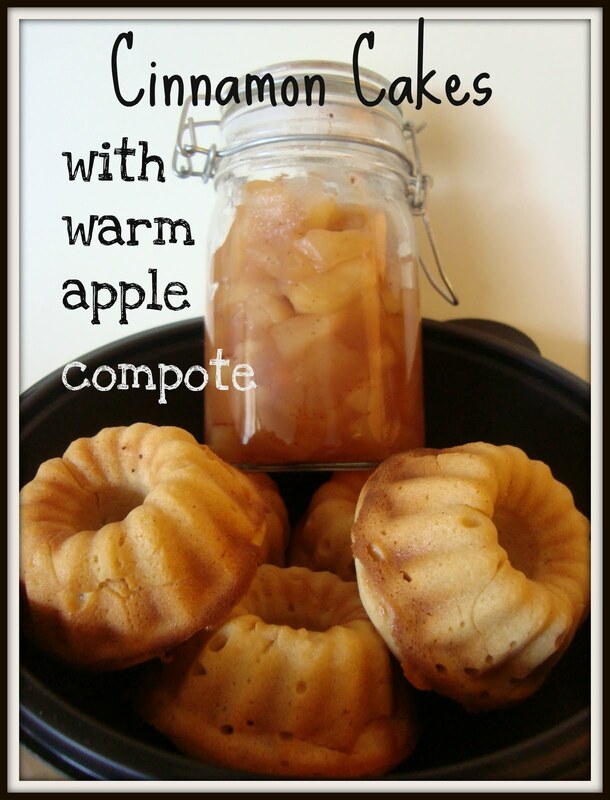 These cakes are a great fall dessert, especially on colder evenings. The apple is such an autumn flavour and the warmth of the dessert makes it that much better. Well I'm off to bed. I'll be ready this week with some new recipes for dinner and deserts!